In June 2016, Epcot got Frozen. No really, it really got Frozen! For the first time in forever (get it? HaHa!) 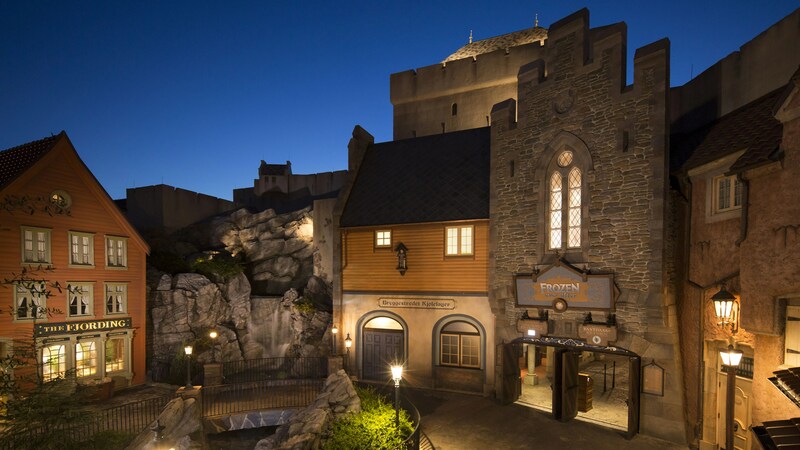 “Frozen Ever After” is now open at Epcot’s Norway Pavilion at Walt Disney World Resort! The new attraction is inspired by the blockbuster hit Frozen. The ride celebrates a “Summer Snow Day” in a family-friendly adventure in the former Maelstrom ride location. A stone archway greets guests to the kingdom of Arendelle. A royal proclamation poster announces the “Summer Snow Day” celebration as guests begin their stroll. On their way to the harbor, guests will get a peek inside Kristoff’s icehouse, as the “Official Ice Master and Deliverer” and walk through “Oaken’s Tokens” at the port of Arendelle. Visitors should watch the sauna door, where Oaken likes doodling in the steam! Guests board their boats at the harbor (which look like the former Maelstrom viking ships!) Sven and Olaf kick off their journey in the Willow Forrest before sailing through Troll Valley, and up the North Mountain. Anna and Kristoff welcome guests to the palace, while Olaf twirls on the ice. When the glittering doors open leading to the Ice Palace Great Room, guests are encouraged to sing along to Elsa’s familiar anthem, “Let It Go” as the Queen’s ice magic surrounds them. As the boat glides back down the mountainside, happy Snowgies surround Marshmallow. He roars his mighty greeting with a blast of his cold breath on guests’ return to the Bay of Arendelle. In addition to the Frozen Ever After attraction, you can also visit the cozy Royal Sommerhus, which is modeled after a traditional Norwegian cabin in Trondeim. 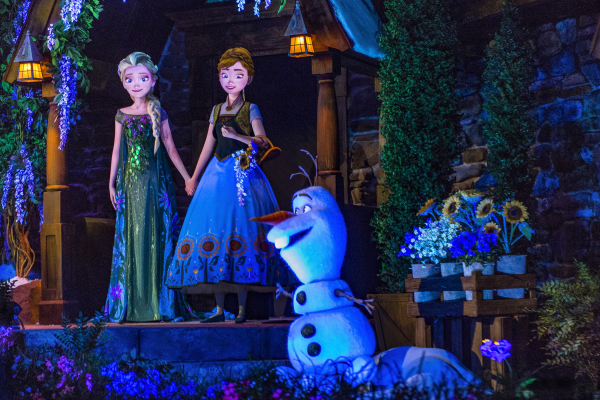 The story is that Anna and Elsa have opened their charming country cottage for visitors! As you walk through, note that the sisters’ receiving room includes details reflecting their personalities: snowflakes on the white wooden shutters and rug for Queen Elsa, and a sunflower pattern throughout Anna’s area. This is the permeant character greeting area for Elsa and Anna and, as of this posting, you can get FastPass+ for the meet and greet to save time waiting in line! 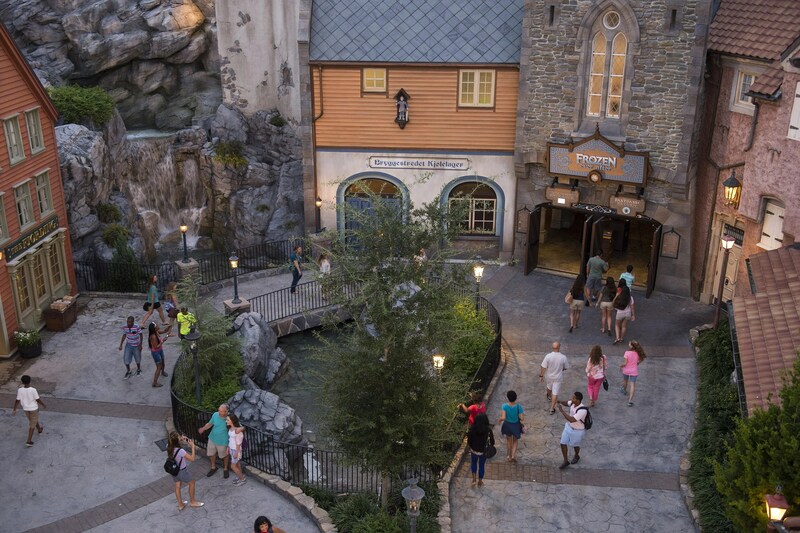 Throughout the Norway pavilion, note the traditional Norwegian architecture, décor and artifacts. Disney Imagineers studio and traveled to make the area authentic. So, the next time you are at Walt Disney World, make sure to visit this new attraction and revamped area of Disney Parks!